Eclipses are basically cosmological miracles. 1. We're able to have solar eclipses because the sun is exactly 400 times the size of the moon, but the moon is 400 times closer to Earth. That's right, you can thank simple geometry for one of the most stunning natural phenomenons. The perfect matchup of those proportions is why it appears that the moon perfectly obscures the sun during a total eclipse. But thanks to the moon's changing orbit, in about 50 million years, it will no longer blot out the sun perfectly. 2. The sun makes up more than 99% of the solar system's mass. The sun is frickin' HUGE. The rest of the solar system's mass is split among the eight planets and their own little moons, comets, asteroids and assorted dust and gas surrounding the sun. 3. And if the sun were the size of a typical front door, Earth would be the size of a nickel. Hey everyone, we're living on a tiny planet. So tiny, in fact, that more than one million Earths could fit inside the sun. 4. There's an asteroid that has rings, like Saturn. Chariklo is a "small object" (aren't we all) that has two icy rings around it (don't we all). It orbits between Saturn and Uranus, and it's only about 154 miles across. 5. There's also a planet made of diamonds that's two times the size of Earth. The "super earth," aka 55 Cancri e, is most likely covered in graphite and diamond, making our dirt and water planet look like a real dud. 6. And it rains diamonds on Jupiter and Saturn. Hailstones made of diamond form when "lightning storms turn methane into soot (carbon) which as it falls hardens into chunks of graphite and then diamond," according to the BBC. The largest diamonds are about one centimeter in diameter. 7. Oh, and there's another planet where it rains glass sideways. In 2013, the Hubble telescope spotted a blue planet that kind of looked a lot like Earth — except that that planet has a temperature of about 1,832 degrees Fahrenheit, and it rains glass sideways, at about 4,300 miles per hour. 8. All of space is almost completely silent. In space, no one can hear you scream, but no one can really hear anything, anyway. There are some vibrations and sound waves that are imperceptible to humans, but overall, space is a vacuum, and it's pretty darn quiet. 9. One of Saturn's moons is walnut-shaped because it's absorbed some of Saturn's rings. Look at the little UFO-shaped planet! 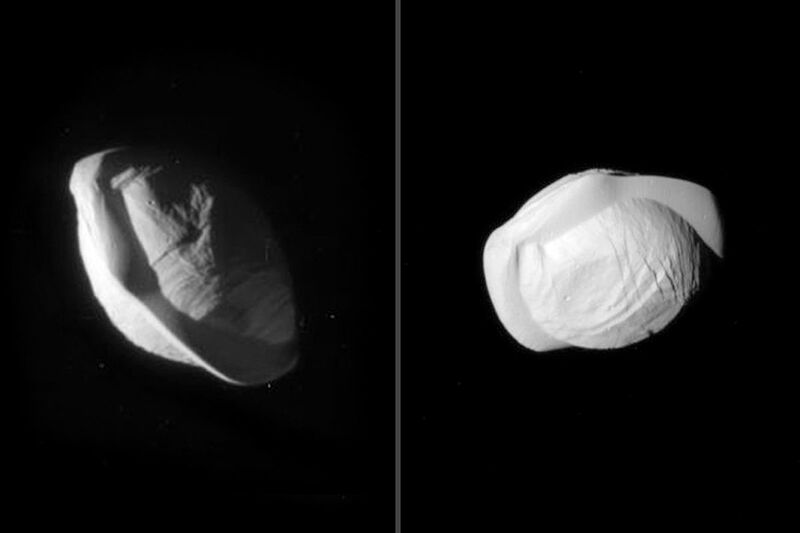 Pan's distinctive equatorial ridge isn't because it really wants to look like a ravioli; instead, it's because the moon accumulates some of Saturn's runoff ring particles as it orbits. Scientists first theorized that Pan had its unusual shape in 2007, but it wasn't confirmed until it was photographed for the first time in March 2017. 10. The largest asteroid in the solar system is a whopping 329 miles in diameter. It's called Vesta, and yes, 329 miles is really big — that's about 25 times the length of Manhattan. 11. All of the planets in the solar system could fit between the Earth and the moon. With about 4,990 miles to spare! 12. Mars is inhabited solely by robots. Right now, there are about six spacecrafts on the red planet, which means that Martians are just robots. Right??? 13. There are more trees on Earth than stars in the Milky Way. Fact: There are about three TRILLION trees on our fair planet, and only a measly 100-400 billion stars in the galaxy. 14. But there are way more stars in the universe than grains of sand on Earth. The universe is way beyond the Milky Way galaxy, because it's...everything. It can be hard to estimate how many stars are out there because we don't know how big the universe is, but scientists estimate that the number hovers around 1,000,000,000,000,000,000,000,000 stars, or a septillion. That's massive, especially compared to the seven quintillion, five hundred quadrillion grains of sand on Earth. 15. Olympus Mons on Mars is so large at its base that an observer on its peak wouldn't know they were standing on a mountain because its slope would be obscured by the curvature of the planet itself. It's the tallest known mountain in the solar system, which means it has some pretty impressive stats: Its base is the size of Arizona, the whole thing is16 miles high, and it has five-mile-high cliffs at the bottom. 16. A day on Venus is longer than a year on Venus. A it takes Venus 243 Earth years to do a full rotation on its axis, but 225 Earth days to do an orbit of the sun. My head hurts just thinking about that. 17. The bootprints from the moon landing will probably still be there millions of years from now. There is no wind or water erosion on the moon, so unless a meteorite comes by and wipes away the prints, they could be there...forever.